"Faithful to the show, and should be very enjoyable for fans. Strong design and story, if a little unfocused in places. Recommended." I really like Stargate: SG-1 which may slightly affect my love of this game, but in just about every way I can think of, this is a terrific adventure game. Thoroughly recommended, particularly if you're a Stargate fan of course. Awesome adventure game, I really enjoied it! I really like that there are more options how to solve some puzzles. 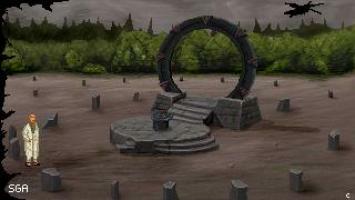 I don't like Stargate show, but I loved that game. Overall amazing"
Stargate Adventure is a superb game, the experience playing the game is cool. Puzzles may be sometimes too easy for those "Monkey Island" and "Operation Stealth" nerds like me, but the "Hotel Dusk -215" generation will probably think they are complex or at least ok. If I was to criticize something it would be there is a cut-scene in the beginning (after playing the first minutes) that last way too long and talks about three different issues (what happens with the planet at the beginning?) Also I am a little lost with the characters and plot line as I saw the Stargate movie, but not the series. The game is definitely a must-play, 8 over 10, congratz. I cant see the .avi with my favourite player, but not inside the game. After the "Sektor" credit, no display, whatever the configuration options. This game is definitely the most bogus AGS game ever. I absolutely loved this game and was very disappointed that it ended so quickly (would have loved to of seen more). I am a big fan of Stargate and thought Sektor 13 did a superb job of making it realistic, graphics were amazing and the puzzles were just right. Is it just me or the main character moves sooo slowly! It takes an eternity to make him walk from one point to other and I feel sleepy by then! It would have been helpful if we could get descriptions of some of the futuristic things that don't exist in 2007 when we "look at them" instead of getting "I don't see anything special" comment. I don't feel like reading the readme everytime. I didn't see the movie so I'm even more clueless. However I'll definitely play it till the end as the other aspects of the game(graphics, story, general feel etc) are quite good. It's a Great Game, It's a shame theres no other Stargate Games out there. I Was looking forwed to Stargate-SG-1-the-Alliance. But just as it was getting shiped out to Store;s M.G.M canned the game. I'm dreaming in a second chapter of this stargate team.... But to be original, maybe in the SG Atlantis team, or with a alternative group of SG-members. This game blew me away! I was expecting an ametuar ok game in the begining, but this was great! The story line was well thought out, the graphics were intresting, sector13 really put some work into it. The puzzles were just about right, perfect for the unexperienced player as well as the experinced. The ending was a bit sudden, I didn\'t expect Anubis\'s entrance. Anyway, this game was great and up their on my favorites, if it was a little bit longer it would be perfect. It\'s not really scary or bad for those easily frightened or those easily offended, but still enjoable. Basically, you GOT to play this game RIGHT NOW! The graphics and the animations are amazing. They have a professional look, they are coherent and cohesive. The music is good, as well as the story. The dialogs are pretty good, but unfortunately the broken English detracts from the experience a bit. Overally, this is a great game. Just one crystal-related puzzle drove me crazy and I ended up solving it almost by trial and error. I must admit it made sense, but wasn't easy. This is one of the most professional looking games I've seen in a long time. Damn good job!